Born on 25/11/1883 at Sheffield. 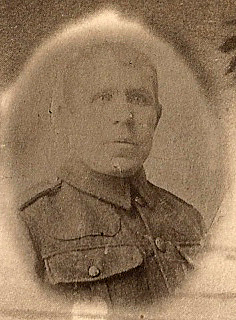 George enlisted on 18/1/1906 into the 3rd Reserve Bn.York & Lancs, # 8370. By the 1911 census he was at Napier Barracks, Karachi, India. During the war he was with the 1st Bn. of the York & Lancs, being discharged on 31/3/1916 following a gun shot wound to his left arm, earning him a Silver War Badge. George married 29 year old widow Nellie Foer’s at Ebeneezer Chapel, South road, Walkley on 23/3/1917, she was a file cutter, George a steel forgeman. In later life George was a Hamden pub regular and worked at Moss & Gamble, Wadsley Bridge until aged 70. George died on 13/8/1971.